Got back from Vancouver Island and Mt Rainier Nat. Part last week. Here is a picture of a huge Douglas Fir. I had no idea that they got this big. Some of them were over 10' in diameter and 200' tall! There was also a fair amount of huge Cedar trees. I have seen the Redwoods and giant Seqious but I never imagined that Firs and Cedars got this big. I was drooling over these trees and I'd love to have an 8' section on the old mill but she would be begging for mercy if I loaded one of those big girls on her. If you have a "bucket list" going, I'd recommend highly adding Mt Rainier to the list. Not only big old growth but glaciers and alpine meadows with lots of water falls. Beautiful place. Vancouver Island was also a great place which I'd love to go back and spend more time. If you are an outdoor person, then this is the area for you. Hmm, picture didn't show up for some reason. Anyways its a pic of a big tree-trust me on that one. Happiness... is a sharp saw. Yep they get pretty big out here. Yup those Vancouver Forest Region red cedar get pretty big to. 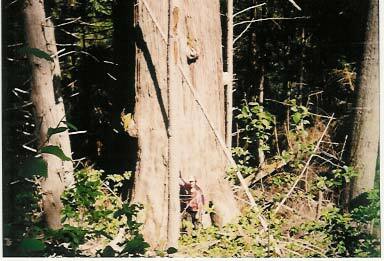 This one is on the perimeter of a logging site way up above Vancouver Island on the Queen Charlottes, same forest region/site class. I'm there in front with a lean on that little hemlock. There are cedars and there are CEDARS. If I get time, I'll post a few more pics. Thanks for the links, I'll look into those Kinsey photos. I'm already planning a trip back to hike around Mt Rainer, but it will probably be a few years. They have a trail that goes all the way around the perimeter of the mountain. 92 miles long and takes about 2 weeks to hike the whole thing. Anyone interested? One to two days is more my style. Mt. Rainier is on my list of things to do in the next few years. After Olympic National Park though. Thought I'd be in that one this autumn, but got sidetracked in the woods elsewhere. New guy looking for a smith in the pacific north west. East to west or north to south - does it matter?